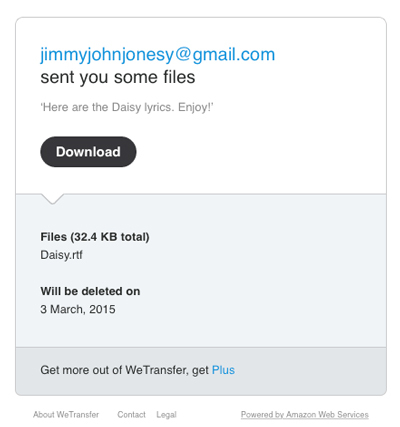 When you transfer files with WeTransfer, your recipient gets an e-mail that looks something like Figure 1. Or perhaps you receive a transfer from someone and get a similar e-mail. The e-mail shows you the list of files that you can download, plus the expiration date and a Download button. Figure 1: An e-mail notice that you have a file ready to download. In your e-mail program, open the message from WeTransfer. 2. Click the Download button. A new Web browser window opens to the WeTransfer site, and you see a dialogue box saying your download is ready (see Figure 2). Choose where to put the file on your hard drive and click Save. On the WeTransfer site, click Okay. Figure 2: You download is ready! You can now close out of your browser and open the file that you just downloaded. The sender will get an e-mail confirming that you downloaded the file. If you or the sender is using the free WeTransfer service, then your recipient or you have seven days to download the file. After that, the download is deleted forever from WeTransfer’s servers. If you have a WeTransfer Plus account, the file stays online for four weeks, unless you, as the Plus account holder, specify a different expiration date.